As the embedded world expands, developers must have a strong grasp of many complex topics in order to make faster, more efficient and more powerful microprocessors to meet the public’s growing demand. 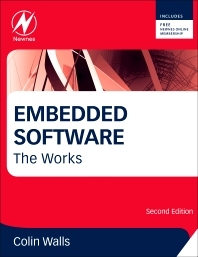 Embedded Software: The Works covers all the key subjects embedded engineers need to understand in order to succeed, including Design and Development, Programming, Languages including C/C++, and UML, Real Time Operating Systems Considerations, Networking, and much more. New material on Linux, Android, and multi-core gives engineers the up-to-date practical know-how they need in order to succeed. Colin Walls draws upon his experience and insights from working in the industry, and covers the complete cycle of embedded software development: its design, development, management, debugging procedures, licensing, and reuse. For those new to the field, or for experienced engineers looking to expand their skills, Walls provides the reader with detailed tips and techniques, and rigorous explanations of technologies. New chapters on Linux, Android, and multi-core – the cutting edge of embedded software development! Colin Walls has over twenty-five years experience in the electronics industry, largely dedicated to embedded software. A frequent presenter at conferences and seminars and author of numerous technical articles and two books on embedded software, he is a member of the marketing team of the Mentor Graphics Embedded Software Division. He writes a regular blog on the Mentor website (blogs.mentor.com/colinwalls). Embedded design developers, computer, software, electrical, and system engineers, and system architects. Upper-level undergraduate and postgraduate electrical engineering students. 1.1 What Makes an Embedded Application Tick? 5.2 Why Convert from C to C++? 8.2 Who Needs a Web Server?